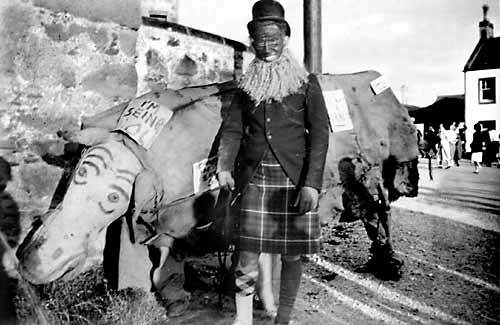 "Fancy dress parade through the streets of Cromarty on lovely summer evening about '34. The Beast, the brainchild of the late Jock MacKay sen. was born in the Workman's Club (Victoria Bar). I was it's rear part, while I think George Easwood was the front. Here it is seen taking a drink from the old cast iron drinking stand (spikit in Lanarkshire) now replaced with a pipe and tap opposite the harbour entrance. Andrew Sutherland dressed in highland fashion was its handler. Andrew owned the seine net fishing boat 'Euphemius' and worked from Cromarty harbour. He would be remembered by his nickname - I can't remember it but it sounded like 'Camshaft'."